Notes: Last year marked the first time that a 14th week was added to the fall season on a trial basis, recognizing that some of our late season migrants are still moving in large numbers at the end of October and into early November. Given the success of last year’s extension, it was repeated this year. As hoped, we had a couple of good mornings this week, but on the whole witnessed migration tapering off. Species diversity was impressive, with a count of 40 or 41 observed on four mornings this week, and a total of 57. However, on three mornings a dozen or fewer birds were banded. 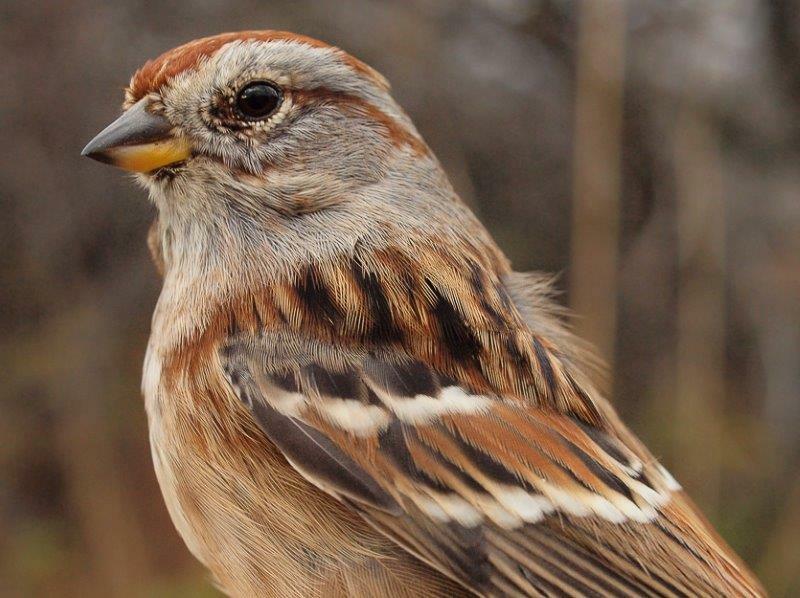 Even with the extra week, the number of birds banded this fall remained below average compared to previous years. The aim of Week 14 is to more truly capture the end of fall migration. 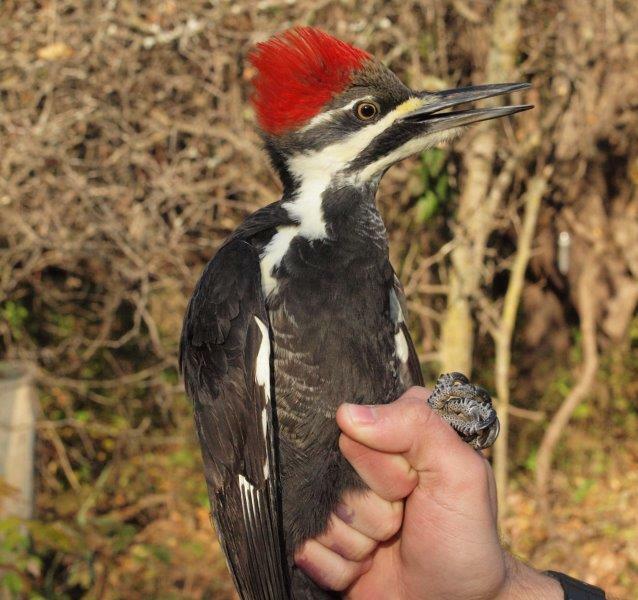 It was therefore reassuring to have relatively few “new” species this week, with only Pileated Woodpecker added to the list of species banded this fall (and this year), while Rough-legged Hawk and Common Redpoll were new observations for the season. Not surprisingly, American Robin remained the top species banded this week, and by a large margin; the season total of 263 ranked second behind only White-throated Sparrow, which with this week’s additions ended up at 326. American Goldfinches returned in numbers this week, enough to reach second place for the week, and ninth for the season. American Tree Sparrow rounded out the top three with a slow but steady presence. The biggest surprise this week was Northern Cardinal, with another dozen banded on top of the 24 earlier in the season, which was already a record. This suggests there was a strong late fall dispersal, something possibly missed in earlier years without full coverage of this week. Despite the season extension, Slate-colored Junco numbers remained low, confirming our suspicion this is a low year for the species. Both kinglets were still around in small numbers this week, and we also banded a modest number of Red-winged Blackbirds and Black-capped Chickadees, plus a couple of Brown Creepers and Purple Finches. Among species observed, Canada Goose rebounded to top spot this week, narrowly ahead of American Robin. The next five species remained in the same order as last week, although with some minor shifts in abundance. Mourning Dove numbers continued to rise, and reached the second-highest weekly average in MBO’s history. Even more remarkable though was the strong flight of Horned Larks, with more individuals counted this week than in the first ten years of MBO’s history combined! Rounding out the final top ten of fall are two more regular species that had dropped just outside the top ten last week, Black-capped Chickadee and American Goldfinch. This week also marked the end of our six-week owl banding season. 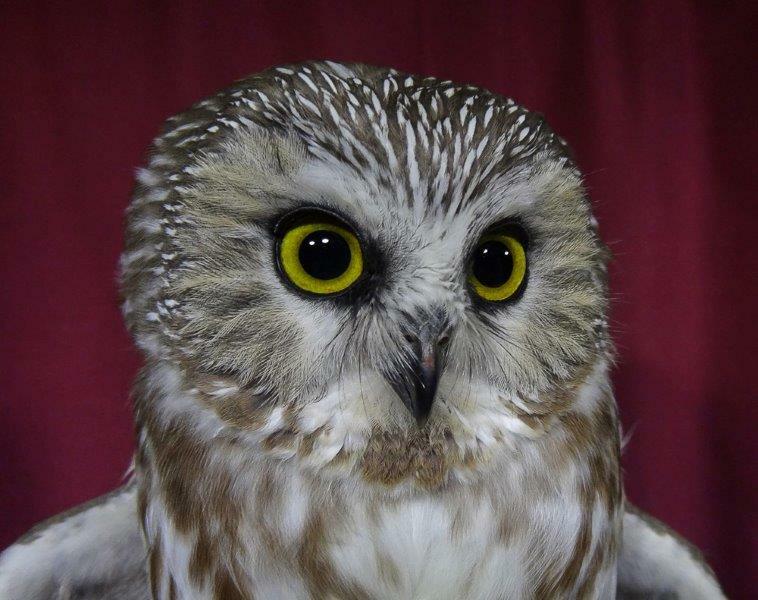 While most other saw-whet owl banders in northeastern provinces and states have been reporting below average counts this fall, the 272 individuals banded at MBO this season is a record for the site, far more than the 235 banded during the same period in 2012. In particular, the final week of the season was unusually productive, with 29 banded this week, compared to a previous record of 16 and a mean of 12 during this period over the past five years. We ended up with 55% hatch-year birds (a far lower percentage than in most “boom” years) and 31% second-year individuals. We now shift to winter operations until the end of March, with periodic monitoring as weather permits. We will also use this time to complete our report on the first ten years of MBO, as well as the 2015 annual report – watch for announcements as these are published!